A user on WranglerForum.com has posted photos that seem to show a special edition Jeep Gladiator during a photoshoot, claiming it’s a Launch Edition version of the new pickup truck. The forum user says the man in the photo is Noah Galloway, a veteran who was wounded during the Iraq War. Galloway lost his left arm below his elbow and most of his left leg. He was also a contestant on Dancing with the Stars. The user also posted an update to the original thread that shows a badge on the tailgate that says something about how this particular truck is 1 of 4,190. 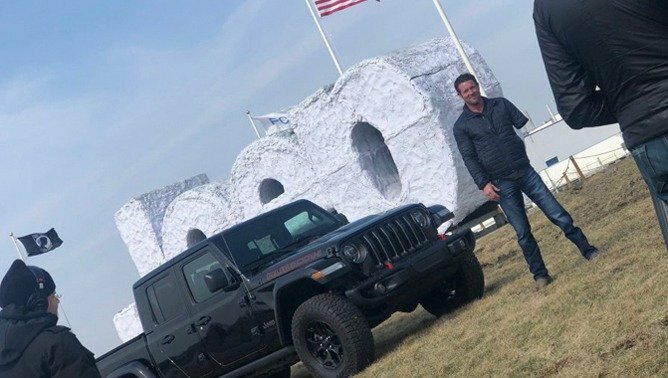 The photo is unclear, but the Toledo area code is 419 and Jeeps have been manufactured in the Toledo plant since the 1940s. The Gladiator pictured is a black Rubicon, and we’re unsure if all Launch Edition models will be based on this beefed-up off-road model. Our review and first drive of the Jeep Gladiator will be published this Saturday. Check back then for our full review, driving impressions and video. Stay tuned for more information on this mysterious Launch Edition Jeep Gladiator. We will share more information as soon as we learn more or it’s officially revealed.